I’ve talked to many people who struggle to decorate and add style to their small front porch. Some houses don’t have a porch at all, but more of a stoop. It’s a bit of a dilemma for sure, but there are lots of ways to use a small porch to your advantage when it comes to maximizing curb appeal! Sometimes small porches (especially if they are enclosed) can be dark and uninviting – there’s nothing to draw you in. A sure fire way to remedy that is to paint your front door a bright color. Go with a color that compliments the body of your home and doesn’t clash with it. Of course a bright color is very eye-catching. Isn’t this a beautiful shade of blue? Say you’re not a bright front door kind of person? A neutral color is equally appealing. This soft yellow is very calming, but still draws your eye to the front porch. This may be the inside of a foyer instead of the outside, but why not do the exact same thing on the exterior of your home? The addition of a mirror to a small, dark’ish porch is the perfect way to capture more light and reflect it around the area, plus it’s certainly something unexpected. 2. 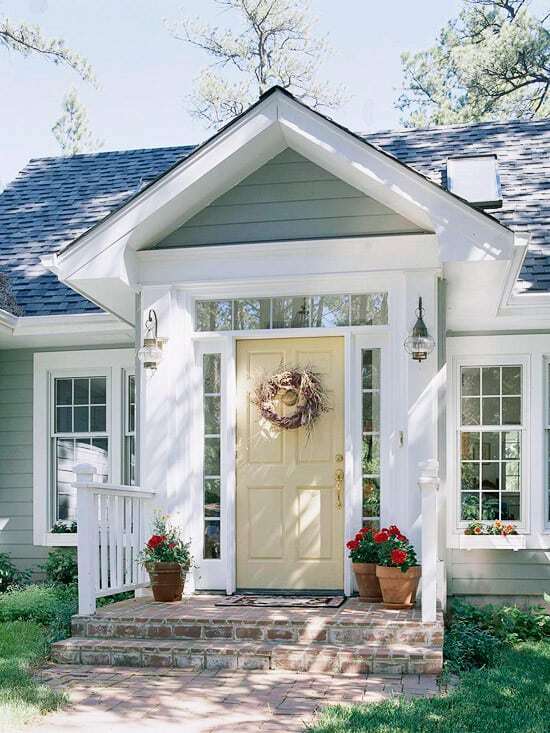 Chase away the small porch ho-hum’s by adding architectural interest. A pair of shutters are very shallow in depth and won’t take up much space at all. If there’s room, add even more interest by hanging plants from the slats in the shutters. Give your uncovered porch some dimension by adding a pergola. DIY pergola kits are readily available at the big box home improvement stores. In fact, we recently purchased one and added it to the front entrance of our storage shed – for exactly this reason – to add architectural interest. 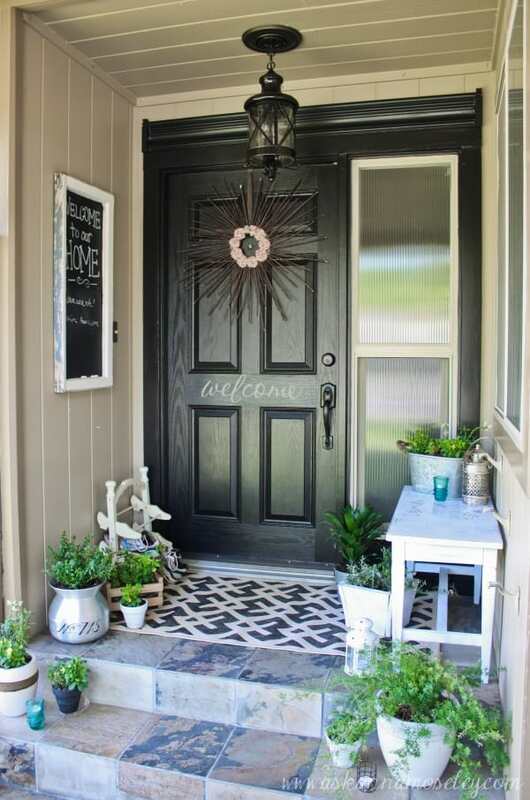 This homeowner’s front porch went from drab to fab by painting the front door and changing the light fixture, adding a rug, a welcoming chalkboard and bench and numerous plants. Click on the link below the photo to see the before. It’s quite the transformation! 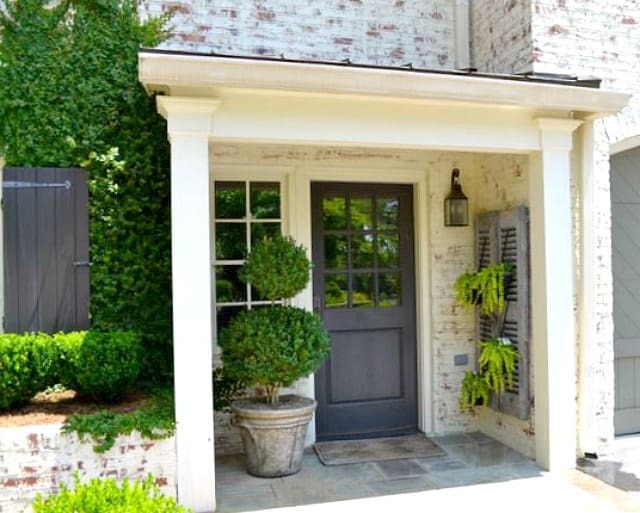 This home basically has no front porch at all, but that didn’t prevent this homeowner from creating a front entry that just oozes with charm. 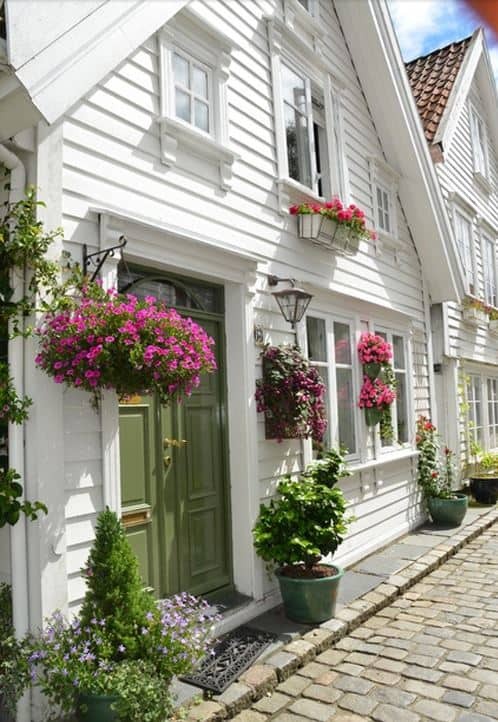 Think window boxes, hanging plants and wall mount planters. Notice the painted door too. 4. Add an eye catching element to the front door. 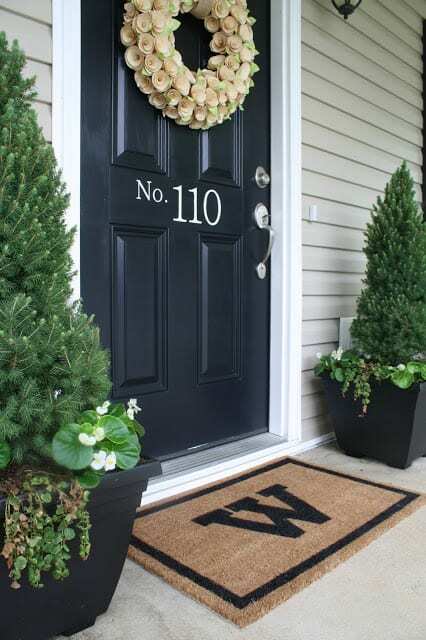 The combination of a great door knocker and oversize house numbers are just what this inset front door needed to bring attention to it. Note the mailbox to the side and the simple light fixtures too. 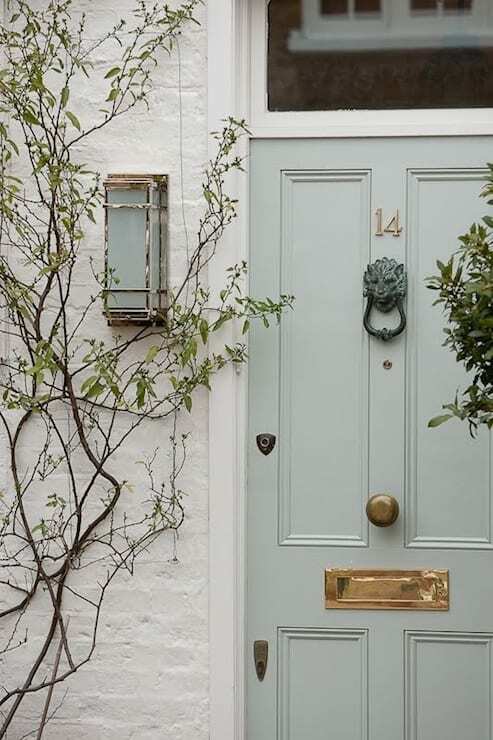 If you’d rather not, there’s no need to drill into your door or surrounding area to add house numbers – add a decal instead. If you don’t own a decal cutter, check on Etsy to have one custom made for you. You can never underestimate the value and appeal of tasteful door hardware. And good grief – the possibilities are endless! 5. Keep it simple and let the architecture of the dwelling speak for itself. 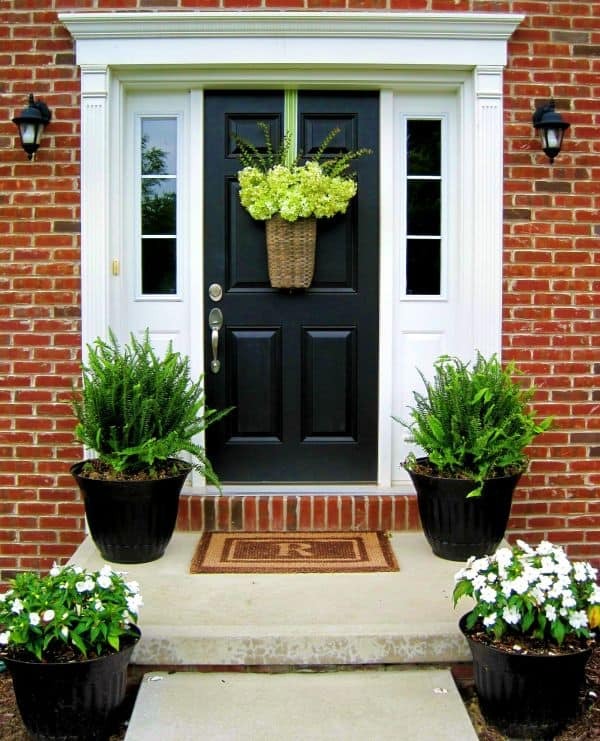 The addition of simple potted plants and a pretty hanging basket are all that this front stoop needed to let the architectural elements around the front door shine. In this instance, I recommend adding larger light fixtures too. 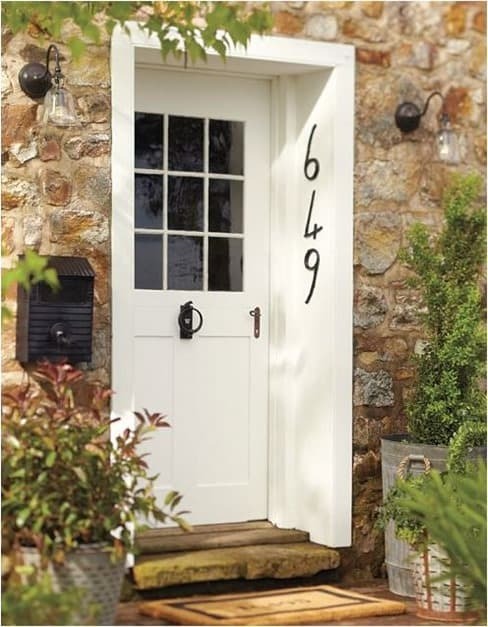 Oodles of homes have this exact front door and sidelight arrangement. Nothing fancy here – just simple door hardware and a planter let your eye appreciate the beauty of it. 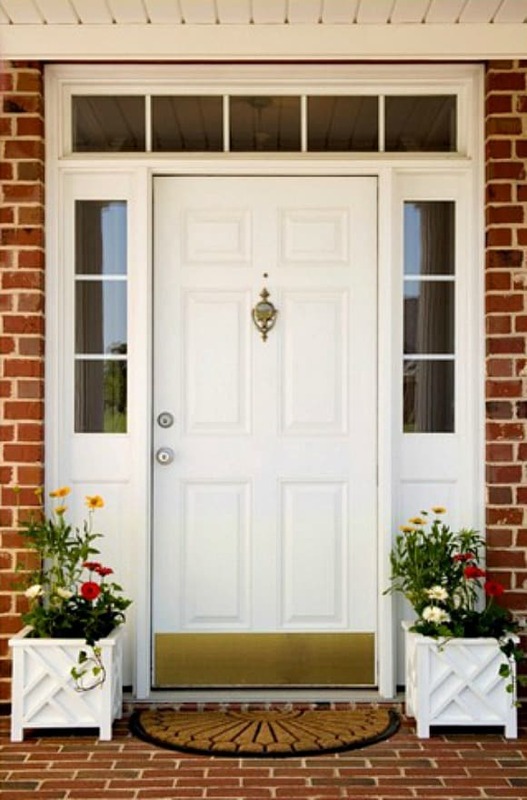 As if all this eye candy alone isn’t enough to convince you of the importance and desirability of a decorated and styled front porch, here’s what my trusted realtor, Pam Carrigan, has to say: “I encourage sellers to always make the best first impression possible. After all, you only have one chance to make a good first impression. 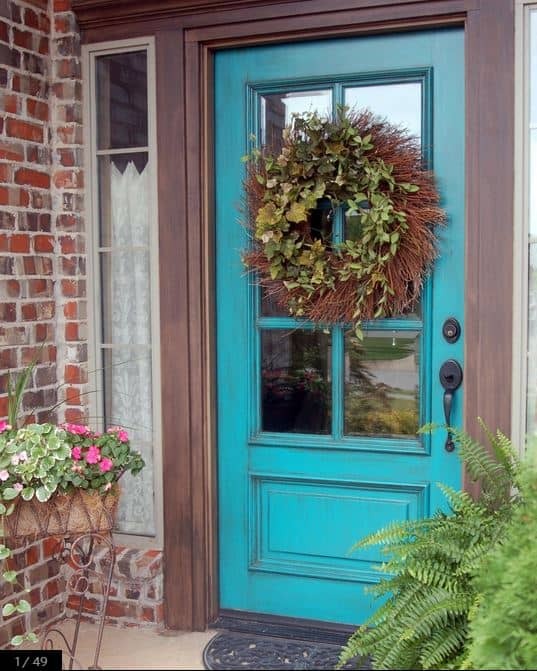 By giving the front porch, door or entry to the home extra charm, character or a pop of color you welcome potential buyers and create excitement for what they will find inside! A great first impression is sure to bring an offer even sooner than anticipated!”. Get more decorating tips and design dilemma solutions such as, How To Add Style To A Small Bedroom, 9 Ways To Revive A Room Without Spending A Lot Of Money, How To Make The Most Out Of Your Small Closet and How To Create An Inviting Outdoor Room, plus more by clicking HERE. Too many beautiful choices!!! How do I pick just one?! Now, THAT”S a tough question, Anne! I’m having the same problem at our new house, Debi. I always wanted a large porch, but now it’s tough to make it cozy. I’ve been all over Pinterest looking for ideas. You’re soooo right – always want what we don’t have! I find parlor palms and ferns to be excellent space fillers on large porches. They liven up the place… then anchoring seating arrangements with indoor/outdoor rugs can really add warmth. Throw pillows make conversation areas really inviting and can be changed with the holidays. Large porches are the best. I have had a very large front porch and it is hard to make it cozy and inviting. I placed furniture, wicker swing, table, chairs, rugs and rocking chairs, in groupings to encourage conversation areas and also a cozy spot for reading. It became a favorite place for family and friends! Knowing you, your porch will be SO pretty, Cynthia! 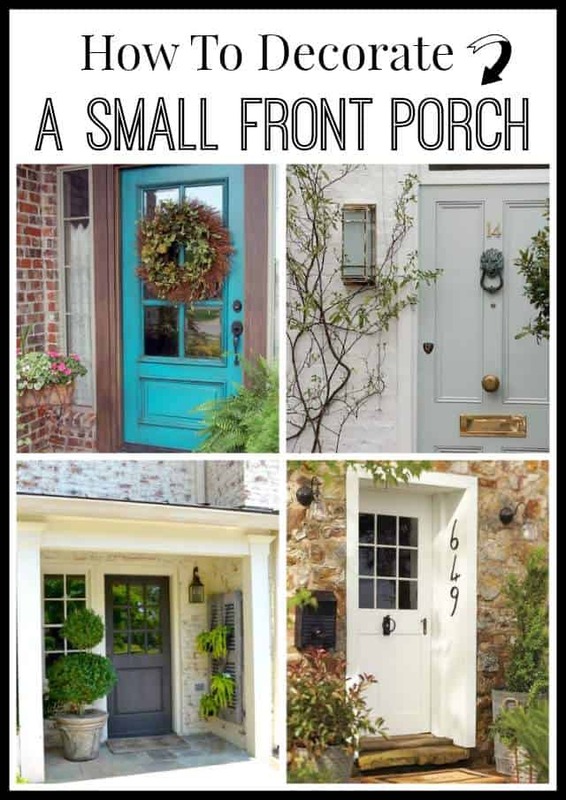 Love a welcoming front porch and these all certainly qualify. This is a great post. So many good ideas. I’m inspired to add something to my front porch ASAP! These all look so great! I love the turquoise door! Thanks for some great ideas! I love that turquoise door too, Pamela. So glad you found some inspiration! I love all of these inspirational pictures! I have a front porch that I love but don’t maximize to its full potential. Love the inspiration here. Thanks for sharing! Glad you were able to find some inspiration for your front porch, Teresa. Thank you for stopping by! They all are just amazing! So much inspiration! Thanks so much for linking up with Share The Wealth Sunday! I liked your post so much that I’ve chosen it as one of my top 5 to feature this week! I will be sharing it on FB as well. I hope you’ll come back Saturday at 7pm to check out your feature and link up more awesome posts! We have just put our mid-century modern house up for sale. Thanks for all the ideas in making that plain front door look exceptional. Flowers sure help. Hope we sell before winter. Great post. 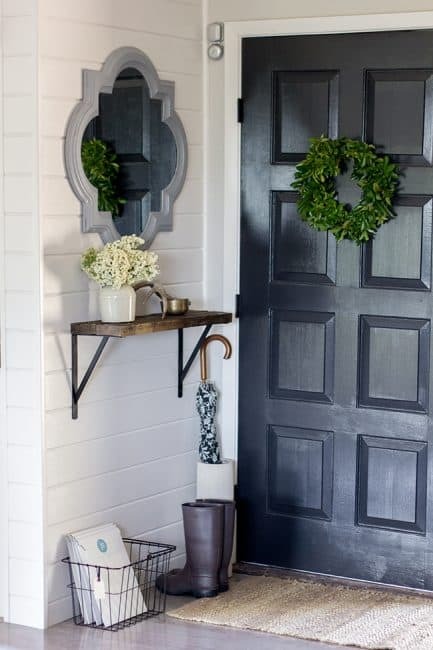 I really haven’t done anything to my front porch yet so this post was very inspiring! I love all these ideas. I can use all the decorating advice I can find! Thanks for sharing with Small Victories Sunday Linkup last week. Pinning to our linkup board and hope you joined us again this weekend. Hi there! Do you happen to know the color of the door of the last photo under #4? Hi Kathy. None of the porches in this post belong to me, so I’m afraid that I can’t tell you the specific paint colors. So sorry! Love the ideas! I have a hard time making the front inviting. Thanks for the post! I really like your tip about adding an eye-catching element to the front door when it comes to your porch. My husband and I have been trying to add to our curb appeal for a while now so we will have to keep these tips in mind. We have been thinking about adding something like a wagon wheel as our eye-catching element so we will have to see how that works out. I am excited to spruce up my front porch for spring, thanks for all the great ideas! Wonderful porch ideas. I am inspired to get busy! Thank you for the great “small porch” ideas that really are for SMALL porches. So many other posts define “small porches” as much larger than mine.